Private Gowdy Shores Beach rights on Lake Michigan from this Union Pier home. Second floor: The second floor consists of a large secluded bedroom with a queen size bed, a daybed with trundle and an attached full bath(shower). Both bed and bath have skylights. The private balcony off the bedroom overlooks the woods and the backyard of the property and is perfect for morning coffee. Thick bath towels, memory foam topped beds with high thread count sheets and brand new bedding are also provided. Perfect for 2 Families: This three bedroom two and a half bath home comfortably sleeps 9 (10 if using the cot, pack-n-play crib also available). 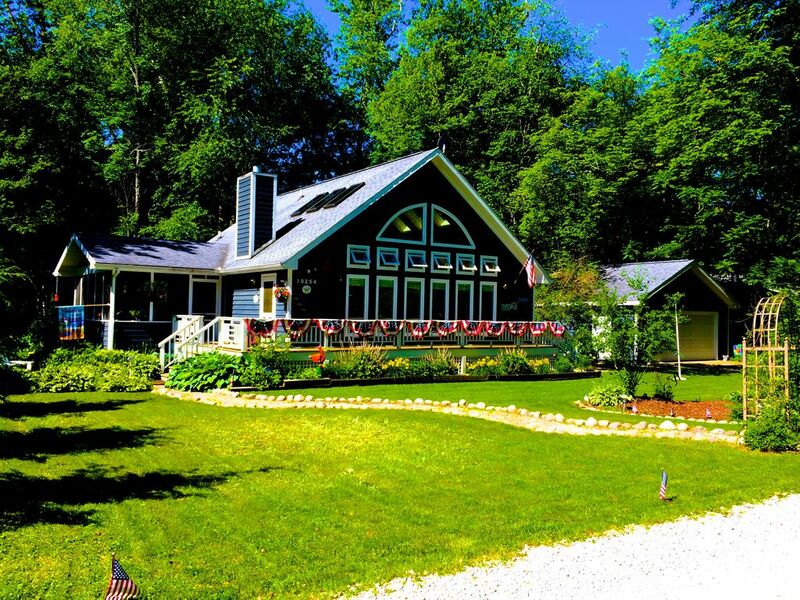 It is perfect for one or two families and is very kid friendly (complete with tire swing). It is also perfect for a romantic getaway or a girls weekend. The setting is peaceful on this wooded lot on a quiet century old tree lined road that leads straight to the beach. The local bakery, deli and grocer are nearby and if you use the bicycles provided it will take about 2 minutes. We have tried to think of everything to make your stay extra special and comfortable and your packing to be as easy as possible. All you need is your bathing suit - we will provide the rest including beach chairs, beach towels, umbrella, cooler with wheels, bicycles, wagon and beach toys. If staying during the fall/winter months enjoy great nature walks right outside the front door or through Warren Woods. Both are great places to go cross country skiing. You can also sled down Warren Dunes or down hill ski at one of the many Michigan ski resorts approximately one hour away. If you don't feel like going anywhere, enjoy the wood burning fireplace in the living room and snuggle in bed under the down filled comforters provided. Tire swing, croquet, badminton volleyball, several bikes, pack and play(crib), full high chair, wagon, Burley runner's stroller, beach chairs, propane grill, garage parking, up to 4 car off street parking. Kitchen: granite counter tops, vaulted ceiling Cell phone coverage is excellent and it also has WiFi broadband internet access year round. New linens with high thread count, new towels. Great location, everything your family needs! Perfect location, all the amenities your family needs to relax and enjoy. The owners were very responsive. Perfect place for a girls getaway! The home was spacious, comfortable and very clean. The owners paid attention to detail and were great to work with. The kitchen was well equipped, beds were comfortable and the living area was spacious. The location was great, just a short beautiful tree lined walk to an amazing beach! We were close to everything we needed from boat rides to grocery stores. I highly recommend this Union Pier gem! Thank you for your lovely comments. We really enjoy making sure our guests have a pleasant stay. We rented this gorgeous home for a family vacation with our young daughters, ages 8, 7 & 4. The girls loved staying in the room with the bunk bed & trundle so that they could all stay together, all of the yard toys and beach toys. We found that we had everything that we needed for a very comfortable stay while we were there and enjoyed the home so much that we only went out to each twice while we were there. The private beach area was only a short walk down the street so we went down there daily and often went back in the evening to enjoy the unbelievable sunsets! We also loved the time we spent together in the screened in porch, reading and playing checkers. The owner was lovely throughout our week, making sure that we were having a nice time. Thank you for your kind words. We understand that vacation time is quite precious. It should be a time to relax and hopefully be stress free. We try very hard to make sure our guests have everything they could possibly need to have a wonderful time and make great family/friend memories. Could not have asked for a better place to stay, this house has everything that you could possibly need to enjoy your time in charming Union Pier. We had a group of ten stay in this place and it was a perfect space with plenty of room for everyone! If you are thinking of renting I 110% recommend! Thanks for a wonderful stay at your humble abode. We had a great girls weekend away at the house. My favorite part is the wide open great room that is to keep everyone together as a group to chat and play games! The large kitchen table is great for a group dinner and just sitting around catching up. We even got a chance to take a quick walk down to the beach to take pictures and watch the sunset. So convenient! Can't wait to go back! Private assoc. beach, vineyards/wineries, golf, horseback riding, fitness center/gym, sailing, windsurfing, tennis, boating, biking, swimming, hiking, restaurants, art galleries, shopping, antique shops, snow skiing, and sledding on Warren Dunes.